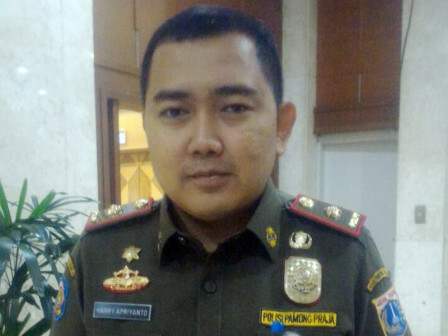 To handle PKL and illegal parking, 500 Satpol PP personnel have been dispatched to sterilize sidewalks in Monas, Harmoni, Jalan Merdeka until Patung Kuda and Gelora Bung Karno (GBK).
" Those locations must be sterile from PKL and illegal parking. If they ignore our warning, we will act decisively"
Jakarta Satpol PP Operational Section Head, Harry Apriyanto said it aims to enforce public order thus road users can safely and comfortably use pedestrian. He describes those personnel have been alerted since Monday (7/16). From that number, 150 out of them have been sent to Monas area, 100 personnel have been sent to Jalan Harmoni-Patung, and 250 personnel have been sent to GBK area. "This is not about Asian Games only, but also make people to be more orderly and discipline," he stressed, Tuesday (7/17). His side will prioritize persuasive action towards PKL and illegal parking on the sidewalk. "Those locations must be sterile from PKL and illegal parking. If they ignore our warning, we will act decisively," he asserted.